The winner of our 10th Anniversary Give-a-way is Mary Ellen from Kansas! The prize is in the mail and she is excitedly awaiting its arrival! 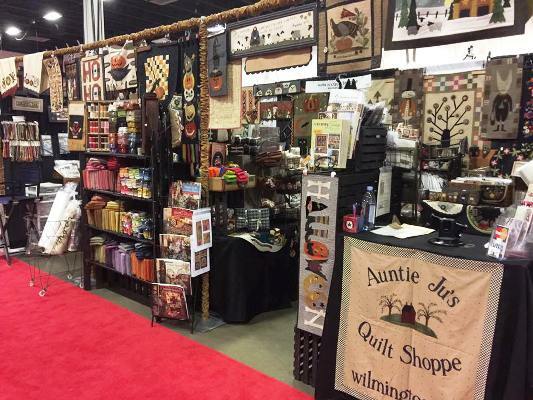 This weekend we are in Fredericksburg VA at the Original Sewing and Quilt Expo. If you're in the area please stop by and see us in Booth 722 at the Fredericksburg Expo and Conference Center, 2371 Carl D. Silver Parkway - open today and Fri. from 10am to 6pm and on Sat. 10am to 5pm. 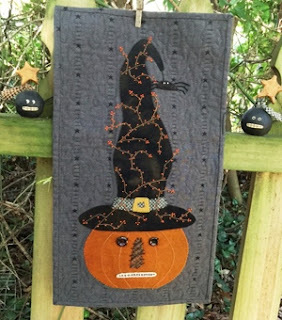 At the show Julie is debuting this latest creation, Mr. Jack O, a small wool appliqué wall hanging, 10.5" X 18.5" - the background is a woven from Diamond Textiles. A quick and easy project to finish for this Halloween! Click on the picture title for more information. Our newsletter with all the latest will be out in the next week or 10 days. If you haven't signed up yet, go here and sign up at the bottom of the 'Categories' column on the left. to watch for the Harvest Moon tonight! In September 2007 Auntie Ju's Quilt Shoppe vended at our first quilt show and in January 2008 our online shop officially opened. Because we are an 'online store only', we thoroughly enjoy meeting and talking with our customers in person as we vend at shows all over the Eastern half of the U.S.A.